Back in 2006, higher end baseball cards were relatively limited in production due to the popularity of the lower end sets among more traditional card collectors. Because baseball collectors were more likely to buy sets like Upper Deck Baseball and the like, high-end products were rarely a priority within the community. This led to a very successful campaign in UD’s 2006 products, which provided collectors who bought these more affordable products a chance at a special redemption. These redemptions were for the first ever Exquisite Baseball cards: each one could be redeemed for a random card from the product’s inventory. The redemptions were a highly valuable commodity, as the cards themselves became some of the most valuable modern baseball cards ever produced. Unlike other baseball collectors, I was (and still am) more interested in player autographs and jersey cards than the set collecting aspects of the hobby. When I saw that 2006 Exquisite Baseball was on its way, I immediately started to research what was available. The redemptions were built around an entire high-end product inserted into the normal releases, and each card would feature an autograph or jersey of a current or retired player, as well as a series of cuts and vastly valuable 1 of 1s. My favorite players, Joe Mauer and Justin Morneau, were prominently featured on the checklist, and the cards they were featured on looked absolutely stunning. They ranged from triple jersey and triple patch cards that featured large full bleed action pictures, to infamous Exquisite patch autos that were possibly the coolest cards I had ever laid eyes on. 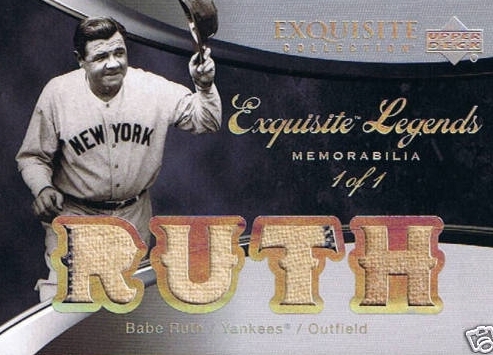 I also saw that Babe Ruth, Lou Gehrig, and the rest of the big value Hall of Famers also had a huge part in this set, and were featured on triple jersey and bat cards that have since become some of the more valuable memorabilia cards of those players. Obviously, whoever was lucky enough to pull one of the redemption cards was going to have something major to look for in their mailbox. As the cards started to arrive and pop up on eBay, it became clear how ridiculously nice some of the cards were. They were designed much like the 2006 iconic football set, and instantly took the hobby by storm. 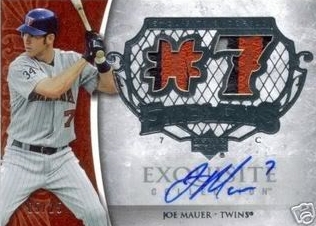 When the first Joe Mauer autograph hit, I started pooling together resources to purchase the card. I knew it was going to be a card that would be the centerpiece for my collection, and I had a feeling there were going to be more than a handful of other collectors with a similar notion. The card boasted a multi-break three color patch, as well as a great game shot to match; I decided it was worth breaking the bank to have it. I had spent the most I had ever spent on a card to that point, but felt okay knowing it would forever be a conversation piece for my collection. Even three years later, that card is still in my collection, and I still look at it with awe each time I add another card to my man-shelf. Since its release, I have managed to acquire almost all of the Twins cards from that set. I now have a second Mauer patch auto with a similar design, an unbelievably cool Justin Morneau patch, a dual Mauer/Rod Carew autograph, and about ten others. Since that 2006 set, there has yet to be another that matches my favor for the original, at least until now. Coming with the new 2010 Upper Deck Baseball products, another Exquisite set will be making its presence known. This time, they will not be redemptions, which will make these cards even more shocking when you buy a box and pull one of them. This time around, there will be multitudes of astounding cards, from six swatch legend cards, to hard signed rookie signatures. Also, UD exclusive spokesmen Derek Jeter, Michael Jordan, Wayne Gretzky and company will be featured on single, dual and triple autos as well, making this version of Exquisite one of the most remarkable baseball sets in years. I loved 2006’s Exquisite, and have used it as a benchmark since its release. There have been very few sets that have even come close to its prowess. I can say right now, just from reading what is in store with 2010 Exquisite Baseball, I may have many more cards on my list to go after. Even though high-end products can crowd the market, the Exquisite brand still continues to be the top of the mountain. Though Exquisite Basketball said its goodbye earlier this month, a new contender is here to pick up the slack.